Visions of Glory is an encouraging exploration of the power of the human spirit and the ways in which faith can inspire existence. 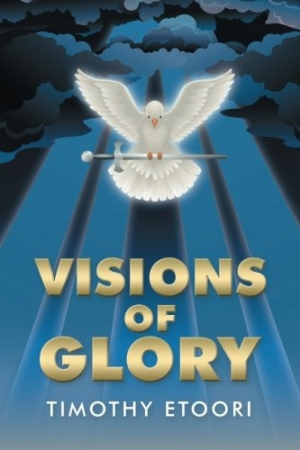 Timothy Etoori’s Christian poetry collection Visions of Glory is both inspirational and thought-provoking. The collection is conveniently separated into sixteen sections, each covering a different facet of life. Headers like “Descent into Darkness,” “Redemption,” “Devotion,” and “Crucifixion” serve as loose guides to the subject matter of poems in each section. Some poems read as almost autobiographical. Stanzas begin with “I” and comment on scenes from a first-person perspective. Other poems, however, could be from any perspective, and deal with bigger ideas, including love, attraction, and generational changes. Shifts in perspective keep reading interesting. Narration moves from the dead in “Grateful Dead” to a horrified world traveler in “The Carcass” to an omniscient speaker in “The Arena,” allowing for a bounty of topics to be covered. Individually, poems are distinct in style and subject matter; still, the book also reads well as a collection, with each poem contributing to a holistic style. Loss is a prevalent theme, whether it’s the loss of innocence in poems like “The Prostitute” and “Acid Rain” or the physical loss of life in pieces like “Hospital” and “HIV.” Yet these pieces are not hopeless; the poet takes great pains to create a sympathetic environment and to further the idea that a firm belief in God can combat even the most catastrophic of situations. Swirls around a nucleus of worry. Both approaches effectively emphasize the poet’s language. The book makes use of both the Bible and instances from everyday life to support its ideas. In later sections, poems sometimes reestablish ideas and perspectives that have already been covered in depth; such poems slow the reading. Though it is decidedly a work of Christian literature, the collection never sermonizes or condescends. Instead, poems explore the ways in which faith can guide one’s spirit through times of happiness and hardship.